WILLIAMSBURG, Va. — “TENACITY: Women in Jamestown and Early Virginia,” a special yearlong exhibition at Jamestown Settlement, a museum of 17th-century Virginia history and culture, explores little-known, captivating personal stories of real women in Jamestown and the early Virginia colony and their tenacious spirit and impact on a fledgling society. The special exhibition, which opened November 10, 2018, and runs through January 5, 2020, is a legacy project of the 2019 Commemoration, American Evolution, a national observance of the 400th anniversary of key historical events that occurred in Virginia in 1619 and continue to influence America today. Women’s roles in the events of early Virginia history were rarely recorded. History gives us only fragments of their lives – a name here, a date of arrival there, a court case, a marriage or a death. Some of their stories have never been told. 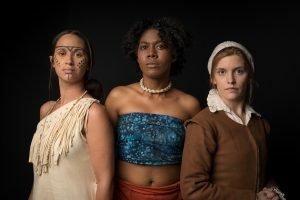 A contemporary photograph depicts Virginia Indian, English and African women and their ‘tenacious’ spirit in the 17th century in the upcoming Jamestown Settlement special exhibition, “TENACITY: Women in Jamestown and Early Virginia.” Jamestown-Yorktown Foundation photo. This story-driven special exhibition features artifacts, images and primary sources – some on display in America for the first time – to examine the struggles women faced in the New World and their contributions. Visitors can hear stories of the first English women in the Virginia colony beginning in 1608 and the Powhatan Indian women they encountered. Exhibits examine stories of the first documented African woman to arrive in Virginia in 1619, and the Virginia Company of London’s effort that same year to encourage the growth of the Jamestown colony by recruiting single English women. From women’s roles to women’s rights, the exhibition connects issues of the 17th century and their relevance today. Discover the stories of Anne Burras Laydon, an English woman who arrived in 1608 at the age of 14 as a maidservant; Cockacoeske, a Virginia Indian woman who was recognized by the colonial government as the “Queen of the Pamunkey” and ruled until her death in 1686; and Mary Johnson, an African woman who arrived in 1623 and labored on a Southside Virginia plantation and later gained her freedom and became a landowner in Virginia. Along with the Jamestown-Yorktown Foundation’s collection of 17th-century objects, the special exhibition features more than 60 artifacts on loan from 22 international and national institutions, including the Victoria & Albert Museum, Museum of London, Master and Fellows of Magdalene College Cambridge, Shakespeare Birthplace Trust, National Archives, Museum of Early Southern Decorative Arts and the Virginia Department of Historic Resources. “TENACITY: Women in Jamestown and Early Virginia” is funded in part by the Commonwealth of Virginia, James City County and 2019 Commemoration, American Evolution™, with additional support from the Robins Foundation. -Anne Burras Laydon: Soon after Anne, age 14, arrived in Jamestown in 1608 as the maidservant to Mistress Forrest, the wife of colonist Thomas Forrest, her mistress is thought to have died soon thereafter. Anne, now the only English woman at Jamestown, was left to find a life of her own in the New World. Within two months of her arrival, Anne married John Laydon in the first recorded English marriage in Virginia. While working as a seamstress for the Virginia Company, she was ordered beaten by Governor Thomas Dale after he found the shirts she made unsatisfactory, a punishment that caused her to suffer a miscarriage. John and Anne Laydon survived the deadly 1609-10 winter, known as the “starving time,” and went on to establish a home in Elizabeth City with their four daughters. -Cockacoeske: In 1677, after Englishmen attacked several Virginia Indian tribes including the Pamunkey led by Cockacoeske, this “faithfull friend to and lover of the English” and other Indian leaders met with the colonial officials, leading to the Treaty of Middle Plantation. This treaty united several Virginia tribes under her authority for a short time, as two tribes dropped out in the first year, and reinforced the boundaries of their remaining Indian lands. Treaty negotiations set a precedent and established a pattern for later Indian reservations. Cockacoeske’s legacy is a reminder of women’s power and influence in traditional Powhatan Indian culture. Court Cupboard, 1650-1670, James County, Virginia, Collection of the Museum of Early Southern Decorative Arts. Gift of Frank L. Horton. -Ferrar Papers, circa 1621: On loan for the first time in America from the Master and Fellows of Magdalene College Cambridge, United Kingdom, the Ferrar Papers are a key source of information about the English women who arrived in Virginia in 1621 and 1622. Compiled by the family of Nicholas Ferrar, a merchant in London, the Ferrar Papers include business documents of the Virginia Company of London, and list the names, references and qualifications of many of the 56 women – recruited to go to Virginia in 1621 to become wives of the settlers. A touch-screen interactive display near the original documents allows visitors to delve into passages of the papers and learn more about these early English women. Ducking Chair, 17th century, Jamestown-Yorktown Foundation collection. 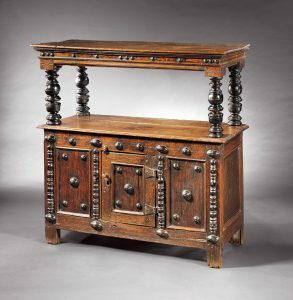 -Court Cupboard, circa 1650-1670: On loan from the Collection of the Museum of Early Southern Decorative Arts, a court cupboard crafted in James City County, Virginia, is one of the oldest-known pieces of Virginia-made furniture. The cupboard is associated with Mary Peirsey Hill Bushrod, who arrived in Jamestown in 1623 at the age of 10. 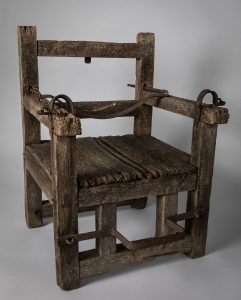 -Ducking Chair, traditional 17th century: An English ducking chair, a recent acquisition to the Jamestown-Yorktown Foundation collection, represents the use of public humiliation as punishment that was common in England and in America from the early 17th to 19th centuries. Offenders – usually women – were strapped into a sturdy chair, which was fastened to a long wooden beam, and dunked into a body of water. A 1634 Virginia court case recorded that Betsey Tucker was punished in this way for “brabbling” or gossiping. 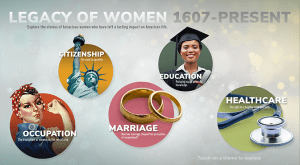 -Legacy Wall: A touch-screen Legacy Wall allows visitors to explore stories of women from 1607 to the present day in five themes — occupation, citizenship, marriage, education and healthcare. Visitors can share stories of influential women across history, including those in their own lives and families, and add them to the Legacy Wall. -Ferrar Papers: An interactive offers additional insight to the 56 women listed in the 1621 Ferrar Papers with the touch of a screen. Presented near the original documents on loan from the Master and Fellows of Magdalene College Cambridge, the interactive features the names, ages and conditions under which these young English women came to Virginia. The original 17th-century script of the document is presented with a modern translation. –Should I Stay or Should I Go? : A third interactive, formatted similarly to 21st-century online review sites, engages visitors in reading positive and negative reviews of 17th-century Virginia and encourages users to decide if they would have stayed in England or gone to Virginia. Humorous reviews are based on actual quotes from the time period, which visitors can explore with the touch of an icon. A series of special programs, from public lectures to performances, will complement the special exhibition through January 5, 2020. Among them is “Mother Tongue,” an original play written by regional Emmy award-winning scriptwriter Abigail Schumann. The play tells the story of three women whose lives and cultures intersected at Jamestown who come together to consider if, and how, the future will remember them and why it matters. “Mother Tongue,” made possible in part by Dominion Energy, will debut May 10-11 and May 16-18, 2019, at Jamestown Settlement and travel to other venues in Virginia. Jamestown Settlement explores the world of America’s first permanent English colony and the Powhatan Indian, English and west central African cultures that converged in the 17th-century Virginia. Through comprehensive and immersive indoor exhibits and outdoor living-history experiences, discover life in the Jamestown colony and its first century as Virginia’s capital. Jamestown Settlement is administered by the Commonwealth of Virginia’s Jamestown-Yorktown Foundation and is accredited by the American Alliance of Museums. Open 9 a.m. to 5 p.m. daily (until 6 p.m. June 15-August 15), Jamestown Settlement is located on Route 31 just southwest of Williamsburg. Parking is free. 2019 admission is $17.50 for adults, $8.25 for ages 6 through 12, and free for children under 6. A value-priced combination ticket to Jamestown Settlement and the American Revolution Museum at Yorktown is $26.00 for adults and $12.50 for ages 6-12. The 2019 Commemoration, American Evolution, highlights events that occurred in Virginia in 1619 that continue to influence America today. American Evolution commemorates the ongoing journey toward the key ideals of democracy, diversity and opportunity. A 2019 series of featured programs, events and legacy projects, including the “TENACITY” special exhibition, will underscore Virginia’s role as a leader in education, tourism and economic development. Learn more at https://www.americanevolution2019.com/. For information about Jamestown Settlement’s “TENACITY: Women in Jamestown and Early Virginia,” call toll-free (888) 593-4682 or (757) 253-4838, or visit https://www.historyisfun.org/tenacity/.